This week, I wanted to write about some of the most famous people who have come from Hungary, in part to provide you with some background on the country and partly because these people have lived such interesting lives! Hungary has a population of about ten million, but it seems to me that its citizens are disproportionately likely to make a big splash. Zoltan Buczolich, the professor at Eotvos Lorand University who organized the hike I went on last Friday, told me that Hungary prides itself on its international competitiveness in several areas, including fencing, swimming, piano performance, chess, and of course, mathematics. We’ll cover some of these and more in…The Greatest Hungarians. 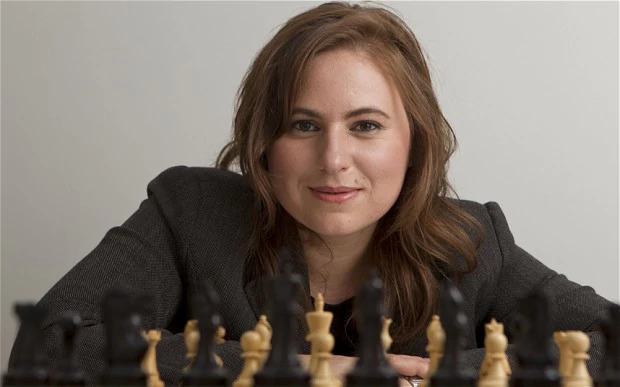 Judit Polgár is widely considered the best woman chess player of all time. She was the highest ranked female player from the time she was twelve, in 1989, until her retirement from competitive chess in 2015, except for a brief period in her final year of playing when she was outranked by the Chinese player Hou Yifan. 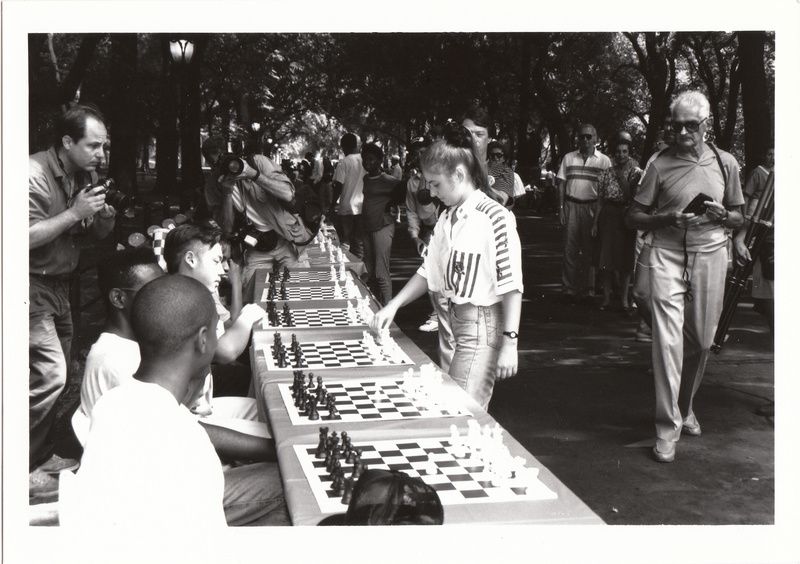 She became the youngest grandmaster ever at the age of 15 years, 4 months, beating Bobby Fischer by several months. She is the only woman to have won against a reigning World Champion, and when she retired was the eighth best player in the world. Currently, she coaches the national Hungarian men’s chess team. 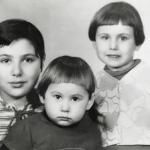 One of the most fascinating parts of Polgár’s backstory is that she and her sisters were the subjects of an educational experiment by their father, Lászlo Polgár, an educational psychologist and chess educator. Based on his philosophy that “geniuses are made, not born,” Lászlo trained all three of his daughters to be chess champions. He and his wife, Klára, homeschooled their children, which put them in conflict with socialist public school officials, and entered them into traditionally male chess tournaments, which put them in conflict with the entire chess establishment. But in spite of this disapproval, there was something that neither Soviet administrators nor chess officials could deny: the Polgár sisters beat everyone at chess. Susan, the oldest, and Sofia, the middle sister, became international masters at an early age and won prestigious tournaments. They paved the way for Judit to become the youngest grandmaster ever and one of the strongest chess players in the world. Judit playing several matches at once. A note for my fellow men reading this blog. Judit Polgár says of her male peers, “my colleagues have finally accepted me, but years ago they did treat me differently. Susan once said she never won against a healthy man. What she meant was that men always had some excuse after losing a game to a woman: ‘It must have been a headache.’” What I want to say to you guys is that when she—any woman—beats me, it’s probably because she’s better than me. I don’t know about you, but I’m going to ask if she has advice or if she could teach me anything. So let’s pledge to eat our quinoa and get proper sleep so that we can avoid headaches, become healthy, and learn more from her lessons. After winning an international tournament in the 1990s. 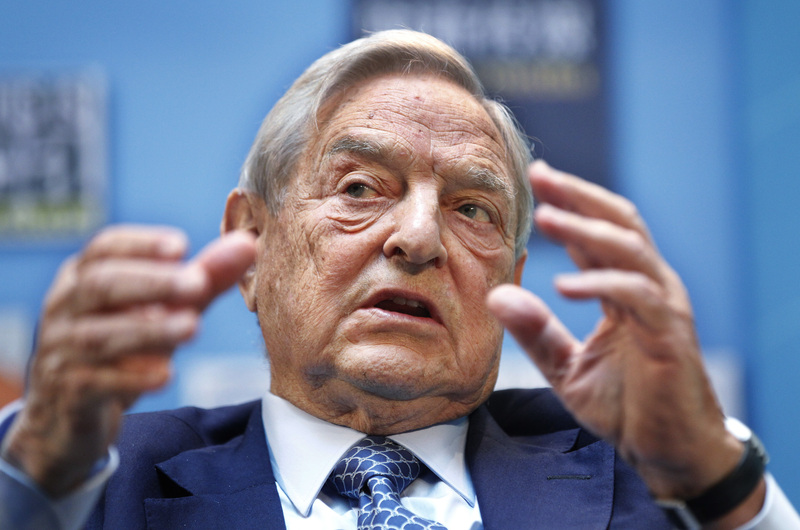 George Soros is one of the most successful investors of the past century. His story begins in Budapest, where he was born in 1930 to a non-practicing Jewish family. When he was young, the Nazi party in Germany occupied Hungary and initiated the systematic persecution of Hungarian Jews. As Soros describes, he and his family survived by purchasing documents certifying that they were Christian and occasionally hiding with sympathetic friends and businesspeople. After the end of World War II, Soros traveled to England to study at the London School of Economics, where he developed an understanding of capitalist markets and eventually constructed his theory of reflexivity, which has driven his investing strategy ever since. Economics students reading this may have already heard of reflexivity. It is the notion that different economic principles will apply to markets that are close to equilibrium and those that are far out of balance. Relatively intuitive, right? At equilibrium, prices accurately reflect a commodity’s value. Bias pushes markets out of equilibrium, which poses a risk to investors—or opens an opportunity, depending on one’s perspective. What Soros observed, among other things, was that when markets are changing quickly they are disproportionately often out of equilibrium. George Soros speaks during a forum at the IMF/World Bank annual meetings in Washington. Soros used reflexivity theory to make investment decisions—including a highly publicized $10 billion short sale of the British pound in 1992—eventually building one of the largest personal fortunes in existence. While his investing strategy is impressive, I am most intrigued by how he has spent the money he makes. In the past couple decades, Soros has become one of the biggest donors to progressive causes and liberal candidates in history. He has spearheaded education and healthcare initiatives across the world, supported both Obama and Clinton in their presidential bids, and even played a role in the Rose Revolution for Georgian independence. Some people wonder if he may have too much influence campaigns and progressive international organizations. In Hungary, Soros has funded the Central European University (CEU) and is an outspoken supporter of immigration, which has put him at odds with Hungarian political leadership. A bureaucratic squabble initiated by Prime Minister Viktor Orban, a right-wing nationalist, over CEU’s license to operate in Hungary has become one of the most closely watched political bouts in Hungary. The fight is unlikely to be resolved soon, as it has become a proxy for some of the critical issues that Hungarians face, including growing nationalism, the influence of the United States and the EU in domestic affairs, the rise of consumer culture, uneven modernization and threats to traditional institutions. Harry Houdini was one of the most talented escape artists in the world. He was born to a Jewish family with the name Erik Weisz in Budapest in the year 1874. Just four years later, he and his family moved to New York, where he became a U.S. citizen. While he didn’t have much of a connection to Hungary for most of his adult life, he is certainly one of the most famous people to be born in Hungary. 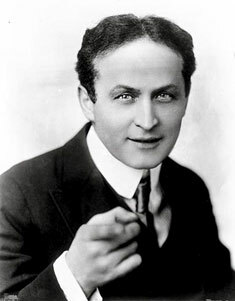 One of the reasons that I mention him is because in 1899 he was performing in my hometown of the Twin Cities when he made his big break. That was when Martin Beck saw Houdini, was so impressed that he offered to become Houdini’s manager, and set him up on the national Orpheum vaudeville circuit. Below are a couple of his famous acts. He performed many of these until he collapsed on stage in 1926 with a fever of 104. He was rushed to the hospital where he was told he had appendicitis. He refused treatment, performed another show, and died later that night. 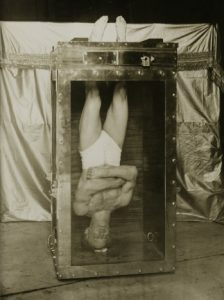 The so-called Chinese Water Chamber escape. 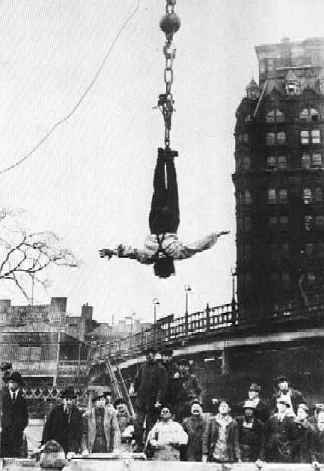 An upside-down suspended escape Houdini performed many times, sometimes from the building housing the local newspaper. 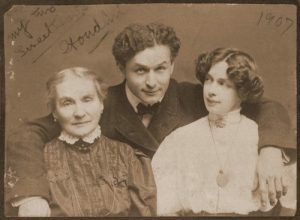 Houdini in a cute family photo with his wife and mother. The second installment will come at the end of the week. This entry was posted in Uncategorized on January 23, 2018 by nathaniellarson.